HUHC serves the highly motivated, high achieving student, and every aspect of its curriculum is designed to provide such students with the resources they need to meet their academic objectives. We combine the support of a strong community with the freedom to pursue individual goals. In this way we emphasize student ownership and direction of their own education. At the same time, we recognize that it is our responsibility to support students so that they can explore, reflect upon and achieve their educational objectives. All HUHC students are working to attain a designation that marks their diploma and transcript as having been achieved with an extraordinary level of distinction. From its inception every first-year HUHC student has begun their collegiate careers with a common curricular experience called “Culture and Expression” (C&E). C&E is a year-long, four-course cluster designed specifically for HUHC students. In the second through fourth years, HUHC students tailor their honors educational experience by choosing from among HUHC Seminars and Honors Options that can be used to enrich any of regularly offered Hofstra course. 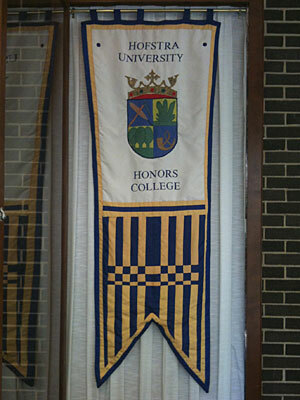 It is in these years that HUHC students tailor their honors work to fit their passions and interests. This HUHC curriculum works in tandem with all Hofstra majors. It does not require extra courses nor extra time to complete the degree. Quite the opposite is true, as HUHC students usually proceed more quickly than most through their Hofstra-wide degree requirements. In short, HUHC students pursue any of Hofstra’s 140 majors while simultaneously earning honors credits that are needed to fulfill the requirements for one of the HUHC designations.